11 A None No Power Seat 11 A is a standard Business Class seat however, the proximity to the lavatories, galleys, and position of the bassinets may be bothersome. 11 C None No Power Seat 11 C is a standard Business Class seat however, the proximity to the lavatories, galleys, and position of the bassinets may be bothersome. 11 D None No Power Seat 11 D is a standard Business Class seat however, the proximity to the lavatories, galleys, and position of the bassinets may be bothersome. 11 E None No Power Seat 11 E is a standard Business Class seat however, the proximity to the lavatories, galleys, and position of the bassinets may be bothersome. 11 F None No Power Seat 11 F is a standard Business Class seat however, the proximity to the lavatories, galleys, and position of the bassinets may be bothersome. 11 H None No Power Seat 11 H is a standard Business Class seat however, the proximity to the lavatories, galleys, and position of the bassinets may be bothersome. 11 K None No Power Seat 11 K is a standard Business Class seat however, the proximity to the lavatories, galleys, and position of the bassinets may be bothersome. 17 A None No Power Seat 17 A is a standard Economy Class seat that may have slightly extra legroom due to the position of the bulkhead however, the position of the bassinets may be bothersome. There is no floor storage for this seat during takeoff and landing. 17 B None No Power Seat 17 B is a standard Economy Class seat that may have slightly extra legroom due to the position of the bulkhead however, the position of the bassinets may be bothersome. There is no floor storage for this seat during takeoff and landing. 17 C None No Power Seat 17 C is a standard Economy Class seat that may have slightly extra legroom due to the position of the bulkhead however, the position of the bassinets may be bothersome. There is no floor storage for this seat during takeoff and landing. 17 D None No Power Seat 17 D is a standard Economy Class seat that may have slightly extra legroom due to the position of the bulkhead however, the position of the bassinets may be bothersome. There is no floor storage for this seat during takeoff and landing. 17 E None No Power Seat 17 E is a standard Economy Class seat that may have slightly extra legroom due to the position of the bulkhead however, the position of the bassinets may be bothersome. There is no floor storage for this seat during takeoff and landing. 17 F None No Power Seat 17 F is a standard Economy Class seat that may have slightly extra legroom due to the position of the bulkhead however, the position of the bassinets may be bothersome. There is no floor storage for this seat during takeoff and landing. 17 H None No Power Seat 17 H is a standard Economy Class seat that may have slightly extra legroom due to the position of the bulkhead however, the position of the bassinets may be bothersome. There is no floor storage for this seat during takeoff and landing. 17 J None No Power Seat 17 J is a standard Economy Class seat that may have slightly extra legroom due to the position of the bulkhead however, the position of the bassinets may be bothersome. There is no floor storage for this seat during takeoff and landing. 17 K None No Power Seat 17 K is a standard Economy Class seat that may have slightly extra legroom due to the position of the bulkhead however, the position of the bassinets may be bothersome. There is no floor storage for this seat during takeoff and landing. 26 A None No Power Seat 26 A is a standard Economy Class seat however, the proximity to the lavatories and galleys amy be bothersome. 26 B None No Power Seat 26 B is a standard Economy Class seat however, the proximity to the lavatories and galleys amy be bothersome. 26 C None No Power Seat 26 C is a standard Economy Class seat however, the proximity to the lavatories and galleys amy be bothersome. 26 H None No Power Seat 26 H is a standard Economy Class seat however, the proximity to the lavatories and galleys amy be bothersome. 26 J None No Power Seat 26 J is a standard Economy Class seat however, the proximity to the lavatories and galleys amy be bothersome. 26 K None No Power Seat 26 K is a standard Economy Class seat however, the proximity to the lavatories and galleys amy be bothersome. 27 D None No Power Seat 27 D is a standard Economy Class seat however, the proximity to the lavatories and galleys amy be bothersome. 27 E None No Power Seat 27 E is a standard Economy Class seat however, the proximity to the lavatories and galleys amy be bothersome. 27 F None No Power Seat 27 F is a standard Economy Class seat however, the proximity to the lavatories and galleys amy be bothersome. 30 A None No Power Seat 30 A is a standard Economy Class seat that has extra legroom due to the exit however, the proximity to the lavatories and galleys may be bothersome. There is no floor storage during takeoff and landing. 30 B None No Power Seat 30 B is a standard Economy Class seat that has extra legroom due to the exit however, the proximity to the lavatories and galleys may be bothersome. There is no floor storage during takeoff and landing. 30 C None No Power Seat 30 C is a standard Economy Class seat that has extra legroom due to the exit however, the proximity to the lavatories and galleys may be bothersome. There is no floor storage during takeoff and landing. 30 H None No Power Seat 30 H is a standard Economy Class seat that has extra legroom due to the exit however, the proximity to the lavatories and galleys may be bothersome. There is no floor storage during takeoff and landing. 30 J None No Power Seat 30 J is a standard Economy Class seat that has extra legroom due to the exit however, the proximity to the lavatories and galleys may be bothersome. There is no floor storage during takeoff and landing. 30 K None No Power Seat 30 K is a standard Economy Class seat that has extra legroom due to the exit however, the proximity to the lavatories and galleys may be bothersome. There is no floor storage during takeoff and landing. 32 D None No Power Seat 32 D is a standard Economy Class seat that may have restricted legroom due to the position of the bulkhead. The proximity to the galley may be bothersome. 32 E None No Power Seat 32 E is a standard Economy Class seat that may have restricted legroom due to the position of the bulkhead. The proximity to the galley may be bothersome. 32 F None No Power Seat 32 F is a standard Economy Class seat that may have restricted legroom due to the position of the bulkhead. The proximity to the galley may be bothersome. 41 A None No Power Seat 41 A is a standard Economy Class seat in the last row of the aircraft that may have limited recline. The proximity to the lavatories and galleys may be bothersome. 41 B None No Power Seat 41 B is a standard Economy Class seat in the last row of the aircraft that may have limited recline. The proximity to the lavatories and galleys may be bothersome. 41 C None No Power Seat 41 C is a standard Economy Class seat in the last row of the aircraft that may have limited recline. The proximity to the lavatories and galleys may be bothersome. 41 D None No Power Seat 41 D is a standard Economy Class seat however, the proximity to the lavatory and galley may be bothersome. 41 F None No Power Seat 41 F is a standard Economy Class seat however, the proximity to the lavatory and galley may be bothersome. 41 H None No Power Seat 41 H is a standard Economy Class seat in the last row of the aircraft that may have limited recline. The proximity to the lavatories and galleys may be bothersome. 41 J None No Power Seat 41 J is a standard Economy Class seat in the last row of the aircraft that may have limited recline. The proximity to the lavatories and galleys may be bothersome. 41 K None No Power Seat 41 K is a standard Economy Class seat in the last row of the aircraft that may have limited recline. The proximity to the lavatories and galleys may be bothersome. 42 D None No Power Seat 42 D is a standard Economy Class seat in the last row of the aircraft that may have limited recline. The proximity to the lavatories and galleys may be bothersome. 42 E None No Power Seat 42 E is a standard Economy Class seat in the last row of the aircraft that may have limited recline. The proximity to the lavatories and galleys may be bothersome. 42 F None No Power Seat 42 F is a standard Economy Class seat in the last row of the aircraft that may have limited recline. The proximity to the lavatories and galleys may be bothersome. Personal Audio Visual on Demand (AVOD) is available on this aircraft with an extensive selection of audio programming in all classes. Personal Audio Visual on Demand (AVOD) is available on this aircraft with an extensive selection of video programming in all classes. All First and Business class seats feature 110v AC power ports. There is no power in Economy. This Boeing 777-200LR seats 238 passengers in a three-class configuration and is primarily used on long-haul routes. There are 8 flat bed seats in First Class, 35 anlged-flat seats in Business, and 195 standard Economy Class seats. It's one of the best seats if you can ignore kids crying. It's an aisle seat hence you can move around a lot. Plus it's right behind the premium economy, so no one except the immediate seat occupants come to this part. In my experience, most parents are very empathetic to co-passengers and make their best effort to get their kids to sleep. 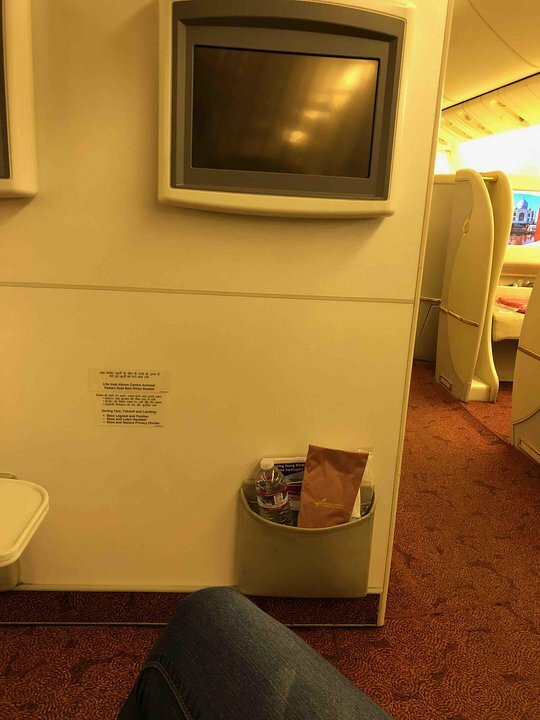 Plus Air India was pleasantly nice compared to the reviews I heard. 16hrs was good, my travel time was reduced incredibly. Even though the flight left an hour late, we reached before arrival time. Tips: Carry healthy food + nice headphone + extra pillows + a charged laptop with things you want to watch in the flight. It has ample leg space. Unfortunately, there is no bulkhead in front. Thankfully the restroom didn't smell even once though there were people waiting/walking all the time. In general, the flight was good. I took the return using the same airline but a different seat. 16hours non-stop is doable. Thanks to the reviews, I carried some healthy food and travel pillows. Tip: Ask for a pillow and charge your laptop beforehand. Also, download something to watch before the flight. The entertainment section is poor. By far not as bad as I had read online. As a frequent flyer on United I would rate it almost as "good". Three warm (and decent) meals, the entertainment unit was working...if you have the chance, try to book a seat ahead of row 26. Seemed that all the small children were in the back of the plane and it's a loooong flight ;-) . Aircraft is very old. Seats are very thing. Absolutely no neck support. Entertainment unit is ages behind. The buttons you press on remote will take ages to reflect on TV screen. Not recommended this seat. The seat is pretty good. 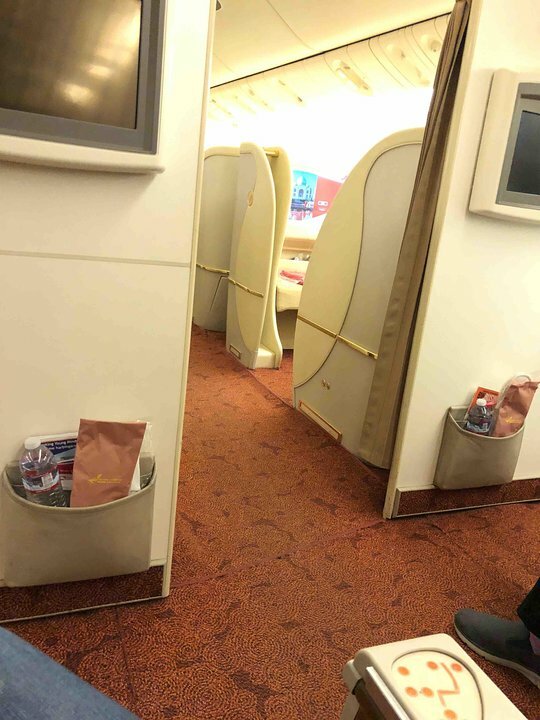 you can enjoy watching the movement of the wings and also as the seat is not over wings, you can enjoy the whole view outside the window as well.Talking about the Air India services , it was kind of average , although the food was good and the legroom for window seat is always better. This is an excellent business class lie flat seat. Idealy sutuated behind the first class bulkhead and far away from any potential noise. Fantastic seat,very comfortable. you will fall asleep as soon as the plan take off.One issue was that seat was on the wings. Yes this seat dies suffer a bit from the loo queues but on the plus side, it means you can get to them first before the queue starts! And how nice to find an airline which has 34" seat pitch in economy. The crew are pleasant but it's strange on a 9 hour flight to have just one bar round (when they give you as many drinks as you want!) but nothing afterwards. Food OK but nothing special. But thank you AI for that legroom - to me it's the most important thing about a flight! The tv remote was broken, service was terrible. I was very excited about a non stop flight from sfo to del. the plane is very very old and in bad shape. 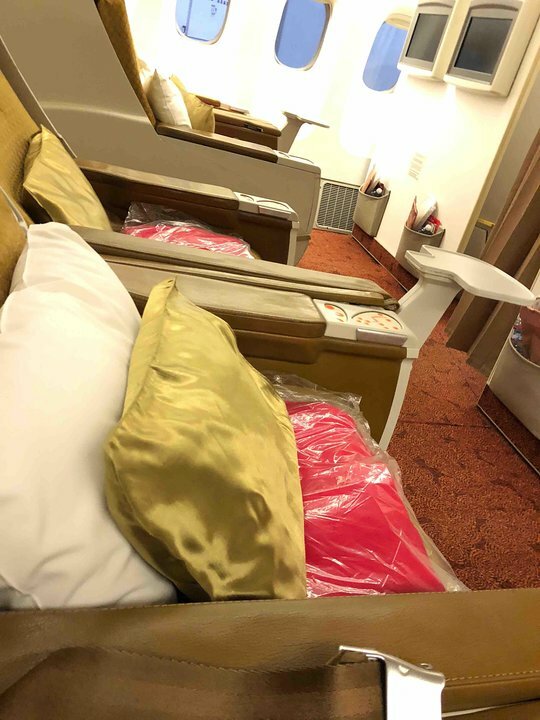 Air India flies 1 versions of Boeing 777-200LR.